by Stirling PropertiesPublished May 13, 2014 May 18, 2017 4 Comments on Stirling Properties Expands Presence in Mobile, Alabama by Acquiring John Toomey & Company, Inc.
COVINGTON, LOUISIANA (MAY 13, 2014) – Stirling Properties announces the acquisition of John Toomey & Company, Inc., a commercial real estate company based in Mobile, Alabama. The acquisition of John Toomey & Company, Inc. further strengthens Stirling Properties’ presence in the Gulf South and is a critical step in Stirling’s long-term strategic growth plans. Toomey’s current portfolio of 1.8 million square feet will be integrated into Stirling Properties’ portfolio bringing the total to 15.5 million square feet. 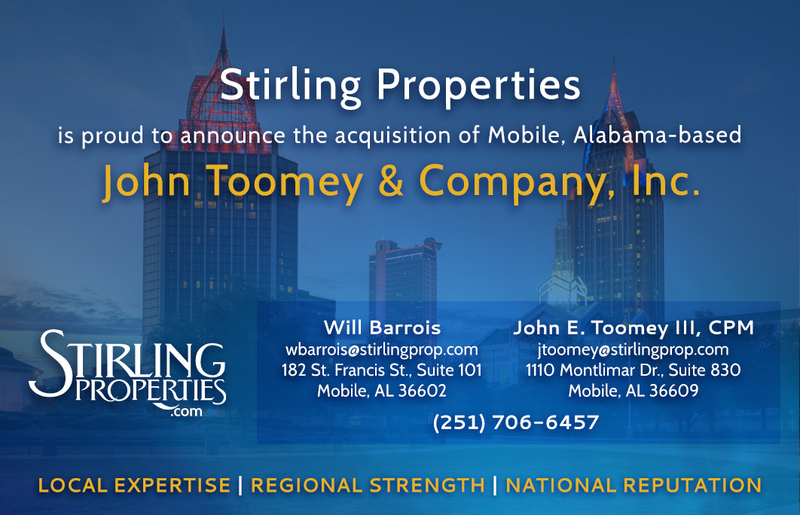 John Toomey and his team will join Stirling Properties, with Mr. Toomey to serve as Broker/New Business Development Coordinator for the Mobile Area. “This alignment reinforces Stirling Properties’ commitment to personally invest in the markets we serve and provides a strong foundation for continued growth in all facets of our company that include the development, management, brokerage and acquisition of commercial properties throughout Alabama and the Gulf South”,” stated Will Barrois, Stirling Properties Vice President/Regional Manager of Alabama and Florida. For commercial real estate needs in Alabama, contact Stirling Properties at their Mobile office located at 182 St. Francis Street, Suite 101, or call (251) 706-6457. You hazve touched some good points here. Any way keep up wrinting.